I have mentioned before that my Mum is an old fashioned Yorkshire woman. She was born a few years before world war II, grew up with rashioning and "make do and mend" being reinforced by all around her. Mum still had these attitudes while I was growing up. If she was a housewife and mother today she would be feted as very cool and ecologically sound. We had an allotment which Dad looked after and we would spend weekends picking peas and other veg ( strange that in all my memories of the allotment, the sun was always shining!). Mum used to knit lots of our jumpers, she baked cakes for us and made most of our dinners from scratch. Of course my opinion of my Mum whilst growning up was that she was old fashioned and deeply un-hip. Thank goodness I grew up and realised how lucky I am to have had such wonderful experiences, some of which I am trying to re-create for the young master Vander-Cave. Mum was very patient in teaching my sisters and I her home making skills (I fear I may not be as patient) although we didn't all pick up the skills that easily! I can't sew for toffee but instead I got the cooking bug, whereas my sister got the sewing and knitting bugs. My sister can cook and bake but it isn't her passion. Give her a sofa to recover or a window to dress and she is in heaven. 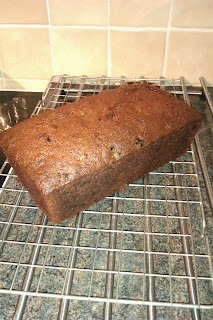 One of the cakes I remember the most from my childhood was my Mum's boiled fruit cake. It was moist, fragrant and bursting with fruit. I remember my mum baking one of these cakes for me to take on my junior school trip to Somerset as my donation to the midnight feast. When I moved into my own home my Mum gave me the recipe for her boiled fruit cake which I attempted but it was never as moist as the cake from my childhood. Yesterday whilst trawling the internet for good recipes to try I found a recipe for a boiled fruit cake. Reviews of the recipe all said it produced a beautifully moist cake. I compared the recipe with my handwritten notes and found the recipes identical apart from one very big difference. The recipe I had copied down from my Mum didn't have any eggs in it. I fear I have been attempting to make an incomplete recipe off and on for many years! I cannot explain how excited I was finding the "lost" ingredient and I felt like I was one of the code breakers of the second world war who cracked the enigma code! 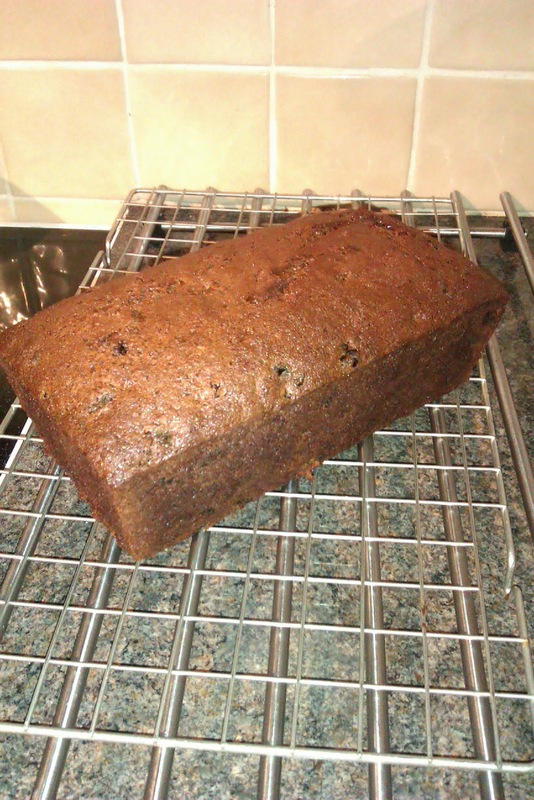 So finally here it is Mum's boiled fruit cake, only 18 years after my first attempt! Butter a 9 x 5 x 3 inch (23 x 13 x 8 cm) loaf pan. Boil for five minutes, remove from heat, and let cool till lukewarm. Stir into this mixture the lightly beaten eggs, flour, baking soda and vanilla extract. Pour into the prepared pan and bake for 45 - 60 minutes or until a toothpick inserted into the center of the cake comes out clean. After 40 minutes I covered the top of the cake with a piece of foil to stop the top becoming too brown. Remove from the oven and let cool on a wire rack. Cover and store, if possible, for a few days before serving. This fruit cake can be frozen.